Taranaki 2050 is a workshop program designed to crowd-source a provincial strategy for transition out of fossil-fuel dependency and other unsustainable aspects of the regional economy such as over-reliance on dairy-farming. Initiated by the governing coalition plus Greens, it has been created by the Ministry of Business, Innovation, and Employment and implemented here by Venture Taranaki. Casting the net widely for attendees didn’t really work: most I spoke to were from either businesses or community-liaison organisations. The only other permaculturist there was Fiona Young, who got me involved half-way through the process – I attended three workshops. Unfortunately neither of us are able to attend this year’s permaculture hui. A three-stage process operated as follows. The first workshop for each topic did a preliminary brainstorming of what was required, identifying goals and the best ways to achieve them. The second workshop processed the key themes that emerged from the first, exploring them so as to articulate them more coherently and focus on priorities. The third workshop took the condensed output of the second and refined it into a form suitable for submission to the regional conference in May and integration into the overall plan likely to be adopted there. Session 3 of that topic, we were given a different paper for each table (about half a dozen of those & that many people at each), and the topic I chose was “Develop an innovation ecosystem” so I shifted to that table when we were told to choose our preference. It listed 15 key points and themes, condensed from prior individual contributions (http://about.taranaki.info/Taranaki2050/Work-Group-Files/Create-and-develop-ideas-(1).pdf). 2. An environment where taking action and doing something, rather than just talking about it, is encouraged; need to overcome complacency and get results. 3. Create a culture of innovation where diversity of ideas are welcomed, a safe environment, incentivise risk-taking, remove barriers to testing ideas. Another priority was evident but poorly-drafted so I’ll just give you the best bit: Develop an innovation ecosystem that encompasses a physical location, access to funding, people and talent. Session 3 refined this into the concept of an organising hub & network – and it then emerged as the leading priority. The teamwork I saw was effective: tasks were achieved in relatively small time-frames, the process seemed consistently rapid and efficient. However there were instances of group reps failing to follow instructions when reporting findings to the plenary. Asked to report the three main priorities identified by the group, one woman rambled through at least a dozen. When asked to pitch their voice to the room so everyone could hear, most failed to even try, so we only heard about half of what they said. To err is human, and fortunately the process was designed to capture the key points on paper, collected by one of the organisers after each time-slot, to ensure all were compiled and integrated into the eventual plan. That will be considered during a provincial conference in May. It may be refined somewhat then, but if adopted it will be used by our government to guide their regional development policy for Taranaki. I hope to be part of the establishment and operation of a regional hub and network, which the plan is likely to signal is the best way to put government policy into effect. Thank you Dennis, an interesting read. Has any of this been published for community consumption elsewhere? It would be very interesting to read future progress reports. Not as far as I know, Patricia. I hope to be able to report updates on how the situation evolves. The conference in May costs $300 – but if I get an invitation there’s a good chance I’ll attend. A real bite sized epistle. Think I’ll read it while eating my lunch. Today, the festival continues; and now, there’s a knock on the door and a party has arrived for a forest garden tour – gotta go! I might have to come next year when you hold your shinding again. You do that every year, don’t you? me i shall dig out potatoes today and prepare some winter veggies for planting. It’s a bit grey round my way so I’ve canned golf and I’m going to do a pre-winter spruce up of the garden. I’m building a tunnel house in a couple of weeks, so if anyone has any links to useful guides or plans, I’d be most grateful. It’ll be 4m by 2.75m. Looking at pvc piping and wooden framing for the doors and internal supports. On a completed unrelated matter, I found this article quite compelling. It has implications for our understanding of consciousness, both in humans and the wider animal kingdom. Certainly makes me glad I’m a vegetarian. Some links showing method though I think bigger than you are planning for your tunnelhouse. Basics – you have probably thought of most of this. Small one that two people can drag to another site. How the experts do it for a small one. Mistakes and tough workload and bad weather that can affect tunnels negatively. Cheers, greywarshark! I’m getting quite excited about the project. Year round fresh veges, can’t argue with that. Some quite cheap kit sets around for grow tunnels if I find the link I will flick it through regards Skunk. TRP look into the below link haven’t used them however prices look okay ? Cheers, that’s the sort of thing I’m looking at. I’ll also build raised beds, which I think will also be usable to add stability to the walls. Interesting about the styrofoam. But hope this doesn’t result in a supertoxicworm. I thought of flatworms that get a bad press from the UK as having come from NZ and eat their worms. Maybe they are voracious enough to be given a job in the styrofoam line. But whether it would be a good idea to have large numbers of them to act as a breeding and spreading site is another matter. Through their large surface compared to their volume they can exchange gases like carbon dioxide, oxygen and ammonia across bodies. Flatworms can adapt to many conditions, which makes them able to adapt to an enormous variety of habitats. They play important roles for healthy streams, ponds, and lakes. It sounds as if you are getting defensive DF. The people who respond that way have their fears and might want to approach things in a different way to you. When they are as dogmatic as you, then it’s stalemate for a while. What is the sticking point – the bone of contention? I don’t think you really catch on to what I am thinking DF. My idea is to form a respecting lot of individuals that form a collaborative group that looks for answers and finds out why they disagree, what are the points of disagreement and why. You have been really annoying some people with your dictating attitudes. So you have something to learn not that you are right and everyone else is wrong and attacking the others because they don’t fall into line. We all are keen for progress and good change, or so I thought. I wonder sometimes. But we have to band together, we need supportive groups trying to understand each other and work together on the same line and purpose, listening to others, learning, explaining where things could be done differently. Not sharp edged, flint minded people attacking people in the group they profess to be part of. Fractious little shits having a go at each other isn’t going to help us prepare for the future or form a fairer, stronger, resilient community with goodwill to each other and all doing what we can with our personal skills. And people who want to take pot-shots and damn each other and take up our precious time and space on the blog TS can go and get stuffed. Being thoughtful and fair etc doesn’t mean letting toxic smarmies and snakes into the midst and being kind to them, listening and trying to help them, put them right. They will break the zeitgeist of the group and are no better than the French spies that invaded Greenpeace; the government undercover spies that were befriended by NZ activists like the Elses (I think). Good idea. If you proceed to doing so, let me know – better still, announce it here as a project. “You have been really annoying some people with your dictating attitudes.” Really? I thought they were annoyed with me pointing out the truth about their behaviour. Can’t believe any would misread me as would-be dictator. As regards “the zeitgeist of the group”, I agree that it is important. I see it as a model supporting our current govt: centrists forming consensus with leftists. Therefore I must continue to point it out when leftists oppose that praxis. What about your behaviour? I think they were suggesting that you were OTT. You can tell me off for interfering. I carry the thought that we are at the end of a cycle of humanity. Don’t you understand that – while you go on with your intermnable arguments holding fast to your banner Knight who can’t be downed? If I’d done anything inappropriate, a moderator would have said so. Bullies whining about having their misbehaviour punished is hardly something I’m likely to be concerned about, is it? I don’t see your comments as interference, btw. I get that you are coming from a perception of moral equivalence. My response is to point out that it has no basis in reality. “You’ll discover that healthy soil is teeming with life—not just earthworms and insects, but a staggering multitude of bacteria, fungi, and other microorganisms. This must-have guide is for everyone, from those devoted to organic gardening techniques to weekend gardeners who simply want to grow healthy plants without resorting to chemicals. This is Australian Peter Andrews expounding on the value of deep-rooted weeds to the advancement of shallow-rooted grass pasture. Why spray and kill all weeds. It will be good to see little summaries of the high points of discussion on how to get there after your get-together Robert. I guess you have a blog/newsletter where people will give feedback. Good ideas and well-put thoughts can be like butterflies and float off. After talk what is the plan for this, and this, and this, all the different lines of approach, and some will combine to produce a new way of achieving something that we can all adopt usefully. I am questioning people who are happy with the status quo – are they making room for new ideas that wisll help ordinary people? Just proceeding with BAU is not satisfacory, unless it has been scrutinised to see if it is fit for ordinary people and fauna and flora, and if not how can it be changed or ameliorated. and while we are living we can be trying to live collaboratively – I think that is the word for How to get there. What do others think? Learnt how to make 4 cheeses last Saturday. I always drop into this corner of TS every Sunday. A very calm and positive place full of interesting stuff that’s right out of my field of knowledge. I’ve been a lifelong home gardener having been lucky enough to have always had access to a patch of soil which could be worked up into a more or less productive veggie patch. One of the first investments we made when first married in our early twenties was the basic gardening tools which nearly forty years later are polished by use to a fine silky sheen. But our gardening has always been based on lore handed down by grandparents when I was young fortified by old copies of the Yates Gardening guide. I find the things Robert and WtB talk about fascinating, but I have a failure of imagination when I try to place them in the context of the various crises we see bearing down on us over the course of the next generation or so. I keep hoping that people who’ve been able to project their imaginations into the future will share what they think it should look like as a cohesive interlinked working model. I can’t imagine how we will ‘get there’ without deciding which forms of Governance we choose to reject or accept. How do we make these choices given that presumably the political compass will always be as diverse as it is now. Will we even be given the chance to contribute to the direction taken, or will it simply be handed down from on high by the political and corporate establishment? What economic model will be adopted? How do we decide what technologies are desirable and safe to keep pursuing and which are detrimental and should be dropped like a hot potato. How do large urban populations fit into the scheme? Are they going to be ‘encouraged’ to become more engaged with food production? How? What type of housing is the best? What materials, build quality, ownership models etc? I keep thinking it always comes back to politics at some level. How do we govern ourselves in a way which allows recognition of individual autonomy but guarantees the security of the collective and preservation of the environment we depend on? I’m an amateur history buff so I incline to the view that choices we make for the future should be informed to some extent by what our past can tell us. In other words, understand ‘How We Got Here’ in order to understand ‘How To Get There’. I think there has to be more input and action stemming from informed and caring individuals that pushes and supports good politics. At the same time as being aware, informed and active politically we will be looking at the needs we have for health, food supply, collaborative action, protection of environment and a people’s economy which has limits on capital accretion and defence against rabid capitalists. Representative democracy has not served us, and the results are all around us so many that we have assimilated them and that weakens society. But shoulder to shoulder democracy is different; the old style made us lazy and now we are unhappy and scapegoats are chosen to throw rude remarks or heavier things at. And we moan because the pollies can’t fix anything now, because we didn’t ensure they did it in the 1980’s. Together is the way, and try to see each others’ viewpoint and allow good arguments to persuade. Build participatory style. participatory democracy tends to advocate more involved forms of citizen participation and greater political representation than traditional representative democracy. 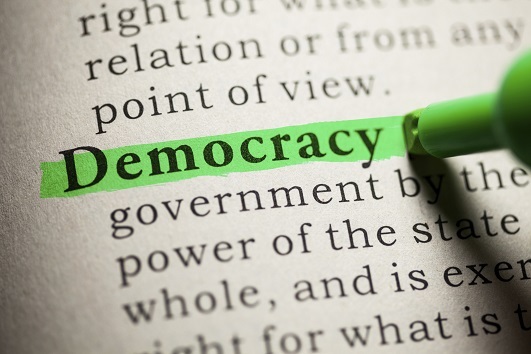 Participatory democracy strives to create opportunities for all members of a population to make meaningful contributions to decision-making, and seeks to broaden the range of people who have access to such opportunities. .A direct democracy or pure democracy is a form of government wherein the citizens have a direct say in the formulation of laws and issues that affect them while a representative democracy is a form of government wherein its citizens vote for or elect a representative to represent them in Congress or the Senate. A combination of stakeholder design plus consensus decision-making is my answer. If the issue is regional, everyone in the region must be able to participate in the brainstorming of the solution. Equal opportunity. Problem-solvers will come to the fore. Some will be authentic, others will be pretenders. The trick then is to organise those with a propensity for problem-solving, and a track record of success, into a task-force. Then you need someone with facilitation skills to conduct the process so as to ensure that teamwork prevails. Human groups self-select leaders, so I’d be inclined to instruct the group to suss out who the likeliest contenders are as they pull together and engage their process. The facilitator ought to call a session for the purpose of allowing the contenders to present their skills and track record of success as leader in various prior contexts, plus how they would exercise leadership in the current context. Once enough working sessions have taken place for participants to get a sense of who the natural leaders are, and how they function, the facilitator ought to call a session to select an interim leader, specifying that the selection is conditional on group approval of subsequent performance. Contenders not selected but recognised by participants as showing leadership potential should then be deemed an advisory support group for the interim leader. If at any point this support group decides the interim leader has lost their confidence, they ought to call a session for stakeholders to endorse a change. Preferably the support group has already formed a consensus as to who ought to take over the leadership, so it can recommend this to the plenary. If not, there would have to be a plenary vote after various contenders tell the plenary why they are the best replacement. By this point, participants will have confidence in the mutual basis of their endeavour, and their operational psychodynamics ought to have become collaboration. If niggles persist, this is a suitable time to direct the natural problem-solvers in the group to form a sub-group to identify the solution via consensus to eliminate each and every niggle. This stakeholder design constitutes a prototype for regional governance, to be applied from the start – any subsequent organisation will emerge from the collaboration past this point. So regard this as a recipe or plan for getting under way on a sound basis – not as an end-product. It is intended as a model of participatory democracy, to eliminate the inertial binding effect that traditional representative democracy always has on the thinking of people. How big is a region? Do you start at the level of local neighborhood and scale up as you go? Is it even possible to scale up the kind of participatory democratic system GWS and yourself are suggesting? Even here on TS there are a range of views ranging from essentially anarchist through to what some call Statist. Do you envisage a bottom up type of participatory democracy that ends with a State Government or a bunch of loosely federated regional / local co-operatives and the end of the Nation State as we know it? Or a top down State Govt. that organises people into ever smaller sub-groups who deal with projects within their scope at the local or regional level? The way we conceived it 30 years ago was local then regional. Since then the concept of the bioregion has emerged as predominant in Green thinking – probably due to the natural synergies that emerge, plus the blending with traditional regional economies. I differ in discounting local democracy. I’ve seen no evidence of folks wanting to do it. Traditional local communities have been displaced by non-local communities during the past two centuries – associations, etc – so there’s little common-interest basis evident. If I was wrong, neighbourhood watch groups would have persisted past the end of the ’80s. Yes, it is possible to scale up. I sent in a submission to govt a few years ago suggesting that parliament’s unused upper chamber be used for consensus decision-making between parties. The basic idea was to run collaboration in parallel with competition. Multi-tasking presumes MPs can be multi-skilled – I can see why conventional opinion would have dismissed my optimism! So what process can be used to get States to devolve power to ‘bioregions’? A bit like asking turkeys to vote for Xmas isn’t it? Aren’t we stuck with Nation States just because most people are too lazy or frightened to imagine anything else and the establishments bolstering the State are too powerful to challenge successfully? Currently, yes. Shift happens via causal pressure. Trade dependency maintains the status quo – shifting focus to the resilience of bioregions can only come from a general loss of confidence in future viability of trading globally. Recall that a decade back peak oil theory & the gfc inclined many to assume global system collapse was imminent. I had to keep reminding folks that it was merely the likeliest trigger coincidence in a sequence of several such periods we’d lived through in recent decades in which the system always proved it has inherent resilience sufficient to withstand perturbations even of sufficient magnitude to threaten stability. There’s a digression into general systems theory & the science of complexity at this point which I will avoid! I tend to see us as dancing on the edge, pulled by the attractor of business as usual on one side, and the attractor of necessity of transformation to provide resilience & sustainability on the other. Past and future. But to answer your first question: as the report I posted first up this morning here shows, our govt is not just already signalling the way, it is providing the process in my bioregion. Appropriate top-down politics is as rare as a unicorn in your local bush – but maybe not for much longer! In the end Nation States are all about the projection of power. The power projected can take different forms but finally it usually comes down to military force. I can’t see the various power blocs made up of groupings of Nation States willingly dissolving themselves in favour of small scale local governance. I also can’t see most citizens of those States wanting them to do so if there isn’t some clearly spelled out system for guaranteeing the physical safety, security and future autonomy of local governance. A few minor States like NZ might head down that track to some as yet undefined extent, but it’s hard to see the trend becoming widespread enough to bring about a sea-change in the way humans organise. Yes, an accurate representation of the status quo. But what if devolution catches on? Scotland has been considering independence quite a few years. Catalonia, not quite as long. There’s even a political movement for the independence of Texas I’ve seen reports about. As long as globalisation remains the ruling paradigm, time will prove you right, in general. However Brexit & Trump are oft-cited as evidence that the elites behind globalisation are losing impetus, or their grip, or both. Try to put up morning Grant. Comments tail off during the day. Perhaps things can be either – divided into major top-down with consultation or smaller bottom-up with opportunity to tap into specialised help from State. Sussing out people as leaders. I think a sheet with grid with required information to tick off, then a bio – what are their interests, is there a religious requirement preventing work on on day of the week, part of the year? Background, family commitments, are they away regularly? These aren’t invasive, they are relevant for a leader, who may have charisma or good knowledge but no good if they aren’t around when the group forays out. Then someone opportunistic who was not elected can take over and be good or a giant mass of patronising defensiveness and passive-aggression. And hundreds/thousands of dollars worth of power tools. Dude used a cheap compound saw, jig saw, sander, glue and a couple of rubber bands. Hardly going to break the bank. Metabo is not a cheap brand. It’s a step or two above Makita and DeWalt. But you don’t need to use an expensive saw. Minimum $300 -$350 for the cheapest gear to build that wooden nutcracker with what’s shown in that vid. Which is why I wrote hundreds/thousands of dollars. It’s a bit like gardening, everyone says grow your own veggies, they’re so cheap, but don’t take into account the cost of materials and the tools required. Actually, the real killer is time one must spend to produce satisfactorily, and also on maintenance of one’s garden & systems. But I only learned that via the doing. Cost of tools – even power tools – is nothing compared to the cost of one’s valuable time. Depends what else one wants or needs to do, of course. No problem if one is just a gardener! Are you a nut-cracker or a ball-breaker. You haven’t got much to add except criticism and actually that is a minus. Perhaps we can get the thinking process going with the sorts that would do this to little animals that are unlikely to harm anybody. Found this rather interesting article from the ABC’s rural news site. As you know or didn’t know, that Northern Part of the Northern Territory is very close to having the Driest Wet Season on record unless we get 20-30mm of rain. This yr it’s the first time I’ve able to get round my bush block mowing the fire breaks, usually I would only 3/4 quarters of it done as I have anywhere between ankle to knee deep water and signs of feral pigs, buffalo and cattle, but none this yr. Heck even the inshore Fishing has been very poor as well, with very temperatures and a lack of run off from the flood plains. To get a good feed of fish we now have to go offshore 12- 50km plus and a mate asked me last night “How’s the Barra Fishing going.? I reply with “I’ve got more chance of catching a boatload of Refugees than catching a Barra atm as all my Fishing is offshore as the inshore Fishing is very poor atm with no run off. My local Fire Captain said yesterday, he is looking to start road side burning in the next 2-3 weeks if the rain doesn’t come soon, which is a 1-2 mths earlier than planned. On Mulloon Institute calendar – Natural Sequence Farming educators. In NSW near Bungendore, NSW Australia. A Water Conference about Australian situation – would be interesting to be observer and learn and share. Discover how local rural communities and farmers are helping build the landscape’s resilience to climate change. Forum speakers are experienced, ‘hands on’ locals who will explore ways that farmers can successfully managing their farms in a changing climate.